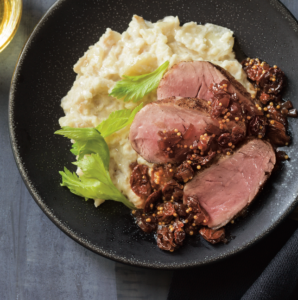 Cooking sous vide is the ultimate kitchen conversation starter. Perfectly prepared meals are only a few lightly supervised hours away thanks to a piece of kitchen equipment called an immersion circulator, which keeps everything at a consistent temperature so you can spend more time enjoying your Friday evening! For anyone new to the process, this recipe for Pork Tenderloin with Cherry Chutney is a tasty jumping off point. Just pair with your favorite side and you’re good to go! Prepare an immersion circulator for use according to the manufacturer’s instructions. Preheat the water to 130°F for medium-rare, 145° for medium, or 160°F for well done. Season the pork generously with salt and pepper, then rub on all sides with the five-spice powder. Place the pork in a vacuum bag and vacuum seal closed. When the water reaches the desired temperature, lower the bag into the water bath and clip the top of the bag to the side of the water basin. Cook for 1–4 hours. Meanwhile, make the chutney:. In a sauté pan over medium heat, warm the oil. Add the shallot and cook, stirring, until tender, about 2 minutes. Stir in the cherries. Add both vinegars and cook, stirring often, until the cherries are tender, about 5 minutes. Stir in the mustard seeds, nutmeg, cloves, and brown sugar. Cook until the liquid is reduced to a syrupy glaze, about 10 minutes. Remove from the heat. Season to taste with salt, pepper, and more sugar if needed. Let cool. When the pork is ready, remove the bag from the water bath, transfer the pork to a plate, and pat dry. In a large frying pan over medium-high heat, warm the oil. Add the tenderloin and sear on all sides until golden brown, about 2 minutes per side. Transfer to a cutting board, tent with aluminum foil, and let rest for 10 minutes. Slice the pork against the grain. Divide the mash among individual plates and top with the pork. Top with the chutney and celery leaves, finish with sea salt, and serve. 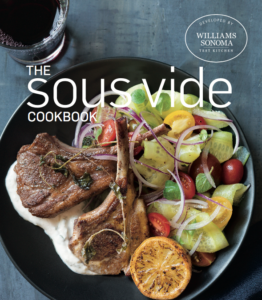 For more great sous vide recipes check out The Sous Vide Cookbook on Amazon.